The area around Icandi is ideal for hiking or walking as it is flat. A stroll to the beach for an afternoon or evening swim is ideal. Take a walk along the beach towards the 300 mountains and you will find it very quiet and beautiful in this unspoiled area. For those of you who like a challenge, a hike up Khao Kalok Mountain a few minutes from the house on the beach is a must. A guide is recommended and it would be advisable to go early in the morning before the heat of the day. Finish off with a swim in the sea. A great way to start the day! Further afield is the fabulous Sam Roi Yot National Park in the Gulf of Thailand, a 15-minute drive from Icandi. High steep limestone wooded mountains are adjacent to coastal marshes and beaches. Perfect hiking territory! The marshes are a breeding area for birds and so have a recreational and educational value. Fine sandy beaches, spectacular caves, mountain viewpoints, offshore islands and forest trails are all there to explore. If you are lucky you may see a Serow, a goat-like antelope which is very rare in Thailand. Three species of primates are often seen in the park, the Spectacled Langur, Long-tailed Macaque and the Slow Loris. Dolphins are occasionally seen in the coastal waters. 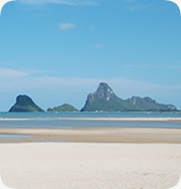 Many more locations can be advised for walking or trekking around this beautiful area of Thailand. The house manager will be able to discuss and direct or arrange day or overnight trips if required.